Marie was so desperate when faced yet again with eviction from her lodgings with her four children, one just a baby of six weeks old, that she phoned the newly founded Samaritans organisation. Chad Varah, the Samaritans founder, informed her that she was his first phone call. This 9-minute episode of the BBC World Service’s Witness programme tells the story of the Samaritans’ origins, and that first call (although, as with all Samaritans callers, Marie is anonymous in the programme). The call resulted in the family spending the night in his church, whilst he drove round in a taxi trying to find somebody among his friends to take in baby Christina. After a futile few hours, the taxi driver, impressed with Chad Varah’s efforts, contacted his wife and they agreed to give Christina a home until accommodation could be found for the family. Here is an extract from Chapter 11 of A Sound Revolution. How to express in words, the feelings that engulf the homeless? Desperation that accompanies the debilitating sense of despair and hopelessness that seep like a sickness into your heart. A sense of worthlessness grips you. For my family, life was rootless. Not knowing where we were going to lay our heads was something we had to endure many times during the long battle with Pye. The relief of finding somewhere, even just for the night, was enormous. Many people over the years assisted us with a bed, some complete strangers whose kindness will always be remembered by the family. Such compassion helped to balance the rough and sometimes callous treatment we received from others. I had never felt so desperate as I did in November 1953. Threatened with yet another eviction and unable to face the London streets, I clutched at the only offer of help available. I telephoned the newly formed Samaritans, founded by the Reverend Chad Varah, the Vicar of St. Stephen’s, in Holbrook, London. He had come to realise that there were many people in London feeling isolated, even suicidal and in need of urgent help. He wanted to give desperate people a lifeline when they had reached the limit of their endurance. He started his life-saving venture with just one telephone in his church office and posters informing would be suicides, that they were not alone; that somebody did care and was prepared to listen on the telephone, in complete confidence to their problems. When he arrived at our lodgings in Earls Court, things were worse than he feared. He found me on the edge of complete physical and emotional collapse and my little son Nigel clinging to me in tears. Dawn and Cynthia sat motionless on the bed, not knowing what to do; we were all exhausted by the drama our circumstances. Only the baby seemed oblivious of the turmoil around her as she lay sleeping, secure in her own world of calm repose. St Stephen’s Church was squeezed between two large and imposing buildings in the financial heart of the city of London. The interior seemed enormous, the heavily decorated plasterwork on the high ceiling lost in the shadows of the impressive ornate dome. The long wooden pews and stonewalls failed to absorb the sound of our footsteps, which echoed noisily on the marble floor. The church seemed a secure refuge from a storm of troubles that had finally overwhelmed me. Musty air and the scent of wood polish and candle wax mingled together, gave off that familiar odour that is peculiar to churches; its quiet peace wrapped itself around me, enveloping me in childhood memories of my convent days. The vicar’s secretary warmly greeted us and she opened her arms to take the baby. The offer of a hot drink did something to reassure me that I was in the hands of friends and gradually I began to relax a little, grateful for the other woman’s offer of friendship, I soon found myself confiding in her. Chad Varah returned as promised but his search was in vain. Unbelievably, the only solution he could offer my family was for us to sleep on the hard wooden church pews. Dawn and I, finally fell into a fitful doze. As we slept, the church came alive and we awoke in the darkness to the sound of rats scuttling across the floor. Terrified of being bitten, Dawn and I found sleep quite impossible and we sat huddled together, watching over the sleeping Christina and Nigel while waiting for the dreadful night to come to an end. Dawn cheered up at the thought of a hot drink. “Have you enough money for a bun, too?” she asked me hopefully. “I’ll see what I can do,” and managing a weak smile I left on my quest. The walk eased the ache in my limbs but my search proved futile and I dared not stay away from the family for long. About to retrace my steps I spied the familiar sight of a London policeman on his beat. He made no attempt to hide his surprise at finding me out so early but to my relief the policeman was able to direct me to a nearby mobile tea bar. Horrified at the suggestion, I pleaded with him, “You can’t ask me to part with her – I can’t do it.” Seeing my distress, he agreed to keep trying but I agreed that if all else failed then I would take the room with Nigel and Dawn. In the end I had to leave Christina in his care and accept the only offer of accommodation available to me. Filled with despair at the hopeless situation and too exhausted to argue further, I trusted to God and the vicar, to take care of my baby. I arrived at our new lodgings, emotionally dead, my tears all spent. I kissed Christina on the cheek, not trusting myself to keep my word if I delayed the painful parting a moment longer. I gently laid my baby into the vicar’s arms. Anxious that I would change my mind, he made a hasty retreat and, without looking back, leapt into the waiting taxi. After reassuring himself that the baby would be in good hands until he could find somewhere the family could be reunited, he left promising to phone the next day. Christina spent several weeks with the generous, warm-hearted couple. They had not asked for any financial reward but Chad Varah told me that his secretary, anxious that the couple should not be out of pocket, insisted that she be allowed to contribute a little money towards Christian’s keep out of her small salary. I found the pain of separation unbearable. I couldn’t sleep and hardly ate, I drank tea and chain-smoked cigarettes to try and calm the growing sense of worthlessness and anguish that threaten to engulf me during those painful weeks of separation from my two daughters. If I had known how things would turn out, would I have made that desperate call to the Samaritans? Had death really seemed the only answer? Questions went round and round in my mind. Was I right to battle against such powerful people? My torturous thoughts were relentless. I was full of remorse at having given up Christina. To be parted from her was too big a cross to bear. “There, there, one day this will all seem like a bad dream, I promise you things will get better,” he told her. “Never, never to do such a thing again. Ring me, go for a walk, but never think of ending your life. Promise me now.” Dawn weakly nodded her agreement, grateful for his reassuring presence. “If he can, I am only too willing to listen,” I told him, grateful for any chance of shortening my family’s suffering. “Part of the reason for the case dragging on was my solicitor Kenneth Brown’s fascination of the technical side of the evidence. He wanted to spend six weeks having evidence prepared when it need only take a matter of a few days,” I explained. “No matter how hard I try to persuade him to take the shorter cut, he simply refuses to listen”, my anger growing as I thought of the added suffering his stubbornness was causing my family. In February 1954, I removed the case from Kenneth Brown, Baker and Baker and placed it in the hands of Mr Dicks. He was in complete agreement with me that all that was required to prove the point in question was for Pye’s stylus to be held up in court. Even so, it was to be another three years before the case finally came before the judge. 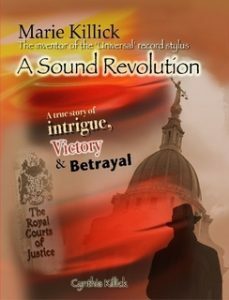 A Sound Revolution is the true story of Marie Louise Killick’s valiant fight against powerful men in the musical world. They had pirated her invention of a stylus that was to revolutionise the quality of sound reproduction of gramophone records. Despite winning her ten-year legal battle in The Royal Courts of Justice in London, her opponents, Pye Radio, found other means to ensure she never received her damages – worth millions. Manoeuvred into bankruptcy, she spent three years trying to prevent the Official Receiver from settling her damage claim against Pye Radio for a derisory sum. She died at the age of 49, penniless and homeless. During her fight she was ‘kidnapped’, her supporters were assaulted and even her solicitor was frightened off the case. During the fight, she was hounded from pillar to post and forced to spend six weeks with her children living in a builder’s yard. Truly a story of enormous courage and tenacity on her part to bring the men who had robbed her to justice! In the People Talk audio feature below, you can hear a short introduction to A Sound Revolution and an extract. You can also follow this link to hear the full Peopletalk interview with the book’s author, Cynthia Killick, Marie’s daughter (skip to 8 mins 30 secs to avoid hearing the extract below again). Inventricity.com has an article about Marie Killick and a video of the Meridian Television progamme A Gem of an Idea. The documentary tells the story of Marie Killick and her battle with Pye. It features interviews with the Killick family, Barrie Blake-Coleman, David Wardell, Paul Ambridge (Chair of the Institute of Patentees and Inventors) and James Dyson (who makes some damning statements about Hoover). In November 1953 an English clergyman set up the first telephone helpline for people considering suicide. The Reverend Chad Varah began the pioneering service from a room in his own church house. This 9-minute BBC World Service programme tells the story of the helpline and the first call Chad Varah received, on 2nd November. It was from “a woman with a family, who was absolutely desperate.” Though anonymous in the programme, that woman was Marie Killick, as told here in The Good Samaritan.